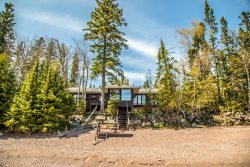 This beautiful rental home is located within walking distance to Silver Cliff, the highest bluff rising directly out of Lake Superior. Cliff Point is a 2 bedroom, 2 bathroom home located in Lake County near Two Harbors, MN. This Lake Superior vacation rental home can be yours for your next North Shore vacation. From this home you can enjoy amazing Lake Superior views plus 200 feet of private shoreline. Comfy leather furniture in the living room make it a great place for family and friends to spend time together. The open layout living room makes it easy to interact no matter what you are doing. Note: fireplace not operational. The large kitchen is well-equipped and includes a dishwasher. Never miss a beat while preparing food in the kitchen with this open layout. Seating for four at the dining room table. The first bedroom on the main level has a queen bed and TV. Enjoy this large bedroom. The second bedroom on the main level also has a queen sized bed. Plus plenty of room to unpack and unwind. The main level bathroom has a tiled walk-in shower. This bathroom also features a deep soaker tub. The lower level living room has a sleeper sofa for additional sleeping, a bathroom, TV, and washer/dryer. The lower level living room is great for sending the kids down to hang out. Note: the fireplace is not operational. Walk out to the pathway leading to your own private section of Lake Superior. The lower level bathroom has a shower. One of the best features of this home is this large lake-facing deck. Nothing but amazing Lake Superior views to be had from your large deck. Step out from the living area onto the deck, then follow the path down to the beach. Cliff Point Cabin is a great place to call home on your next Lake County adventure. Sit back in the swing and enjoy the amazing Lake Superior views. This well groomed property makes getting around easy. Start a fire in the fire circle overlooking Lake Superior. The stairs access to the beach area. The beauty of Lake Superior will take your breath away. This lakeside vacation home has everything you need for family fun on the North Shore. Enjoy scenic views of Lake Superior from your dining room or deck. Or enjoy a stroll along the cobblestone beach when not sitting around the outdoor fire ring. You will feel well rested after relaxing in the beautiful master bathroom with soaker tub, then sleeping on a Tempur-Pedic mattress. The lower level is perfect for playing cards and watching movies. Memories are waiting to be made at Cliff Point. This home is within walking distance to Silver Cliff, the highest bluff rising directly out of Lake Superior. Take in cliff side views along the walkway, where the old Hwy 61 used to be. Winter fun! Spirit Mountain is only about 30 minutes away in Duluth. This rental home is about four miles from Two Harbors where you will find the Superior Hiking Trail Association Office. Enjoy snowshoeing and cross country skiing. Snowshoe on the Sonju Trail in Two Harbors and cross country ski at Erkki Harju Ski Trail (trail is within the golf course in Two Harbors). Cross country ski and snow shoe the Superior Hiking Trail or any of the state parks: Gooseberry Falls and Split Rock Lighthouse are within a ½ hour drive. Have Fun!! Fireplaces pictured are currently under repair and not usable. We apologize for any inconvenience. Dogs are welcome with prior approval and an additional fee. 2 pet maximum, dogs only. Sorry, no cats! This home is available year round. Note: This property has security cameras on the exterior of the home. They are there for security reasons when the home is not occupied. The cameras are not used when guests are present. Crock Pot - 6 qt. Had a great experience, were temporarily locked out, we were helped immediately. The house location is great. Home could use some updating, but we feel the price charged is in line with what you get. We would not change anything. I had to call to check information regarding our stay, the customer service was excellent as she followed up with additional questions to ensure I was able to find the house. She was very personable. absolutely fantastic....beautiful home, all of the amenities, perfect location on the water, just perfect. I would recommend this home to anyone I know. We truly enjoyed our stay at Cliff Point. The house was the perfect size for our two families (including one infant). The large deck was outstanding; the view of the lake was perfect. The one suggestion would be to have the ability to open windows on the lakeside of the house (window or door screens). This would help make it so much cooler inside. Other than that we were vey pleased. The view was wonderful and the location was nice and peaceful. The rooms and bed were comfortable. The only that some of the other group members had were the animal hair on some of the blankets. Besides that everything was very nice. Everything was perfect. Kitchen had everything we could want and more. Fire pit was great. Tempur-pedic beds are a big bonus as that is what we have at home. Only thing would be if the fence enclosed the property on completely on the three sides but that is just because my dog is a runner. Thank you so much. Location was perfect backing right onto the lake. The neighbors are far enough that you have plenty of privacy. Occasionally you can hear traffic from the expressway, but it's certainly not enough to be annoying. The soaker tub with the jets was awesome! Everything you could possibly need was available in the kitchen. Very cool retro appliances! Excellent property to bring your pets to. Our dog loved it, as there is a huge yard for her to run around & explore.